For weeks, we Cubans have lived under a veritable bombardment of references to Fidel Castro, which has increased in proportion to the closeness of the date of his 90th birthday, this 13 August. There is no shame nor nuance in this avalanche of images and epithets. This whole excess of tributes and reminders is, undoubtedly, a desperate attempt to save the former Cuban president from oblivion, to pull him out of that zone of media abandonment in which he has fallen since announcing his departure from power a decade ago. We have left the man born in the eastern town of Biran, in 1926, in the past, condemning him to the 20th century, burying him alive. Children now in elementary school have never seen the once loquacious orator speak for hours at a public event. 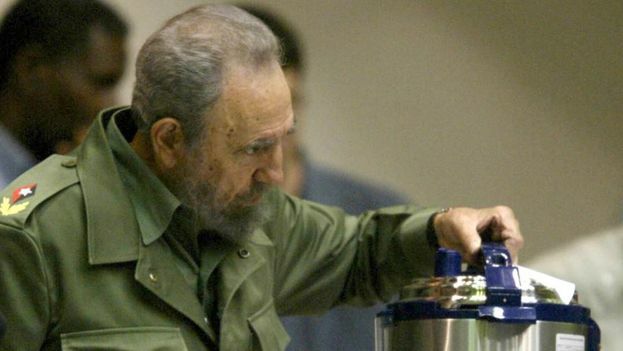 Farmers have breathed a sigh of relief on not having to receive constant recommendations from the “Farmer in Chief” and even housewives are thankful that he does not appear at a congress of the Federation of Cuban Women to teach them how to use a pressure cooker. The official propaganda knows that people often appeal to short-term memory as a way of protecting themselves. For many young people, Fidel Castro is already as remote as, for my mother in her day, was the dictator Gerardo Machado, a man who so adversely marked the life of my grandmother’s generation. Followers of the figure of Fidel Castro are taking advantage of the celebrations for his nine decades of life to try to erect a statue of immortality in the heart of the nation. They deify him, forgive him his systematic errors and convert him into the most visible head of a creed. The new religion takes as its premises stubbornness, intolerance for differences, and a visceral hatred – almost like a personal battle – against the United States. The detractors of “Él,” as many Cubans simply call him, are preparing the arguments to dismantle his myth. They await the moment when the history books no longer equate him with José Martí, but offer a stark, cold and objective analysis of his career. They are the ones who dream of the post-Castro era, of the end of Fidelismo and of the diatribe that will fall on his controversial figure. Most, however, simply turn the page and shrug their shoulders in a sign of disgust when they hear his name. They are the ones who, right now, turn off the TV and focus on a daily existence that negates every word Fidel Castro ever said in his incendiary speeches, in those times when he planned to build a Utopia and turn us into New Men. Tired of his omnipresence, they are the ones who will deal the final blow to the myth. And they will do it without hullabaloo or heroic acts. They will simply stop talking to their children about him, there will be no photos in the rooms of their homes showing him with a rifle and epaulettes, they will not confer on their grandchildren the five letters of his name. The celebration for the 90th birthday of Fidel Castro is, in reality, his farewell: as excessive and exhausting as was his political life.